Come stay at an authentic log home on Ski Mountain in the exclusive Chalet Village in Gatlinburg. This is a built-from-scratch log home, not a standard home 'converted' to a log home. Not much drywall in this home. Interior construction features exposed log timbers and cedar walls. The home features a magnificent and unique floor plan. The living area is anchored by a huge stone fireplace. No need to bring or purchase any firewood. We provide free firewood during the season. The space overhead reveals a cathedral ceiling with exposed log timbers. The furniture is updated and exhibits a mountain theme. The sofa converts to a bed providing total sleep accommodations for 8. A 46' LCD widescreen TV is provided in the living area. A staircase winds behind the fireplace leading to a loft overlooking the living area. The loft contains a regulation billiards table. Two spacious guest bedrooms are located on the first floor with queen size beds. A guest bedroom with a jetted jacuzzi tub serves these bedrooms All bedrooms contain cable flat screen TV's. The kitchen contains all new major appliances and is equipped with all cooking and eating utensils. Outside is a spectacular covered porch with a view across Ski Mountain. The porch has rocking chairs for great lounging and socializing. A gas grill is provided. A 4 person hot tub is located on the porch. Next to the home is a sun deck with full patio furniture and seating areas. Hi, I am Steve Baker, the owner of Timberwinds. I was born in New Jersey, but have discovered there's no place like Tennessee. I travel quite often, but can always count on great R&R every time I can visit this unique log home in the Smoky Mountains. Drip coffee maker and K cup coffee maker! 4 person hot tub on covered porch. We loved our week at Timberwinds! It was a great home base for amazing hiking, horseback riding and llama trek adventures in the Smoky Mountains. Steve was responsive and helpful throughout and we loved having so much space ( and a private hot tub!) on vacation. The cabin over all was great! The downstairs bathroom door stopped latching half way through our stay. The drive way was very steep. Everything else was great! Make sure to bring a big sauce pan if you’re cooking for a good size group. We really enjoyed the stay and it was very clean when we arrived! Be prepared to drive up a VERY steep hill to get to this cozy cabin on the hill. It's surrounded by many other cabins. Quite neighborhood, clean cabin. A little dusty, but with a little attention to the ceiling & corners this is a perfect getaway. If you intend to cook bring a large pot. Glad I did because making spaghetti for 5 would have been a headache with the size saucepan provided. Must also note that the owner is VERY attentive and checks in often to be sure all is well. I felt safe and well looked out for. He even provides coupons to local restaurants, etc. We will be back! The home was beautiful and the views from it are amazing. Our stay at Timberwinds was a relaxing and enjoyable. Despite hiccups in our travel plans and unfavorable weather, we still had a fantastic time. Steve was a perfect host - very accommodating and communicative. Checking in was very easy. We enjoyed making s'mores by the big stone fireplace and soaking our worries away in the big hot tub. It was really nice that it was under a covered porch - so rain or shine you can enjoy the view. 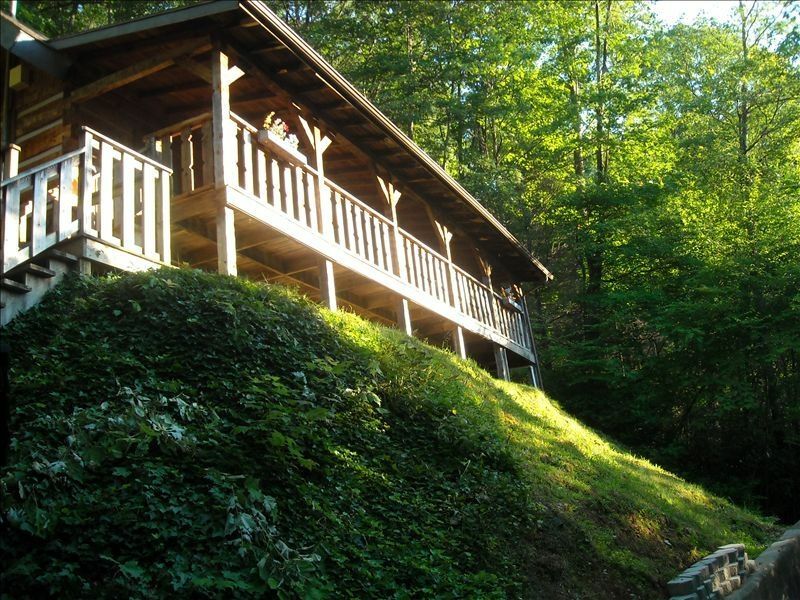 Conveniently located near Ober Gatlinburg, the town and hiking paths - this is a great spot for a mountain getaway! However, although it maintains its quaint mountain charm this town of 3,000 residents often swells to 20,000 people who come to enjoy attractions and leisure amenities that rival large tourist destinations. It is part of the Gatlinburg-Pigeon Forge- Sevierville tourist destination, the 7th most popular tourist area in the USA. Gatlinburg is home to Hard Rock Cafe, TGIF, Corky's BBQ along with some great local restaurants. The largest shark tunnel Aquarium, Ripley's Aquarium is a must see. Gatlinburg is also home to a large craft zone featuring mountain artists, sculpters amd other artisans who have lived in these mountains for generations. There are zip lines, nearby whitewater rafting, great hiking, golf, outlet mall shopping, and Gatlinburg even has even its own ski resort; Ober Gatlinburg, complete with a tram connecting downtown to the ski resort. But my favorite attraction is the hundreds of black bears who live in these mountains and at times venture down to stroll along the city streets. There is no place like Gatlinburg !